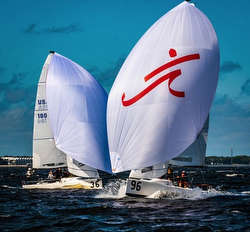 (Tampa, FL)- Fifty-five J/70 teams traveled to Davis Island Yacht Club in Tampa, Florida for the middle weekend of the 2018-2019 J/70 Winter Series. Joel Ronning’s CATAPULT took the victory with 24 points in five races over the two days. The weekend started off with great promise from a weather perspective. Friday was the SAIL22 “Off the Porch Series” that never fully materialized. An impending frontal system with forecasts for rain, thunder, squalls and gusts to 35 kts did, in fact, roll in around 2:00pm, upsetting the scheduled clinic. Anticipating the storms, many teams opted to get out early to get in some practice. Saturday dawned with clearing skies and strong, puffy, northwest winds of 12 to 23 kts, just as forecast. Not wasting any time, the DIYC Race Committee, PRO, and mark boat teams set out to get racing rolling on time at 10:00am. After a few general recalls, racing commenced for what turned out to be a glorious day of sailing on northern Tampa Bay (a.k.a. Henderson Bay) just south of the pretty skyline of Tampa. The RC/PRO team managed to run four races in very tactically challenging conditions. 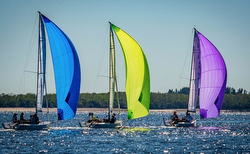 With 20-30 degree windshifts on each leg of the course and massive wind holes and wind streaks, it was easy for teams to gain/lose 10-15 boats per leg! At the end of Saturday’s racing, Travis Odenbach’s B-SQUARED team led the fleet with scores of 1-3-1-4 for 9 pts. Just one point back on the leaderboard were two heavyweight J/70 teams tied at 10 pts each, Joel Ronning’s CATAPULT with a 5-2-3-1 record, while Brian Keane’s SAVASANA posted a 3-1-5-2 tally. Interestingly, Ronning fell ill with food poisoning on Saturday morning and did not skipper his boat. Instead, the team scrambled quickly and recruited crewman Chris Stocke’s fiancé from St Petersburg- Wendy Reuss- to step in and skipper the boat for the day; she guided them to a remarkable outcome for someone that had never sailed, much less skippered, a J/70 before! Sunday dawned light and fluky from the northeast, again as forecast. After several aborted attempts to get a race going, the DIYC RC/PRO team managed to get a race off that will simply go down in the record books as perhaps the worst light air race imaginable. With winds ranging from 0 to 5 kts (e.g. below the J/70 Class minimum recommended wind speed), and shifting 30 to 60 degrees, and very spotty and very streaky (teams were often seen sailing downwind, at the same angle, on opposite gybes); it was not surprising to see dramatic swings in the final race standings. For the one and only race sailed on Sunday, the runaway winner was Doug Strebel’s BLACK RIVER RACING, sailing with a star-studded crew of Tim Healy, and brothers Jay & Jody Lutz (all three are World Champions in various classes). They started at the port end of the line, hooked into a private wind streak, and simply sailed away from the fleet to win by a Texas mile! Not far behind them in 2nd place was Kevin Downey’s MR PITIFUL from Seattle, WA- also sailing with a star-studded crew that included World Champion and North American Champions in his crew- Brian Thomas and Willem van Waay. As a result of the last race, the now happy and healthy Joel Ronning skippered CATAPULT into a “come from behind” victory on the last downwind leg to post a 13th and win the regatta with 24 points. The final run, with 0-3 kts of wind, was so sketchy, so streaky, so full of holes, that it was anyone’s game to win. Rounding the last mark, Keane’s SAVASANA was at the top of the fleet, winning the regatta, and leading both B-SQUARED and CATAPULT by over 20 boats. However, “lady luck” was not on their side, falling into a giant hole (more like a vacuum), while his erstwhile competitors gybed away in the middle of the course and sailed around them. In the final tally, CATAPULT won, then Odenbach’s B-SQUARED finished 20th to take 2nd with 29 pts, while the hapless crew on SAVASANA posted a gut-wrenching 22nd to drop into 3rd place on the podium with 33 pts total. Rounding out the top five were Downey’s MR PITIFUL in 4th place and Greiner Hobbs’ DARK HORSE in 5th place. 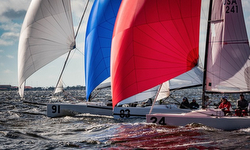 For more J/70 Davis Island Winter Series II sailing information. Add to Flipboard Magazine.